Trying to find a quality chocolatier that combines the craft of making tempting artisan chocolate with amazing natural ingredients such as CBD can be incredibly difficult. That’s why we’re so excited to tell you about Casa Luna and their delicious CBD chocolate bars. When you see the Casa Luna logo, you know you’re in for a treat—literally! The brand focuses on creating delicious chocolate bars without additives or cheap alternatives to real cocoa. Their “bean to bar” approach has resulted in Casa Luna becoming an all-time favorite among sweet-toothed CBD fans. Handcrafted in small batches, the entire process is a labor of love. Available in both milk and dark chocolate varieties, you’re bound to find a tasty CBD chocolate bar that’ll set your taste buds all aflutter. By taking CBD with chocolate, you’ll enjoy a potential wellness boost complemented by a terrific-tasting and superior-quality snack. Super simple and lots of fun! Why Choose Casa Luna CBD Edibles? That’s an easy question to answer: Quality. You see, it’s hard enough finding a decent chocolate bar made with real cocoa beans and no additives, vanilla, or lecithin spoiling the taste. So just imagine how much more difficult it is to find a top-quality chocolate bar also containing CBD. Thankfully, Casa Luna has it covered. Their CBD chocolate bars are organic and handmade, so you know that every single bar you purchase has been made to order for your enjoyment. That alone is worth the experience, especially if you’ve never sampled mouthwatering artisan chocolate before. In addition to their undoubted abilities as chocolate makers, Casa Luna is also careful not to skimp on the CBD side of production. It’s quite an expensive process to produce and distill hemp oil properly, and many brands tend to offer cheaper products that aren’t nearly potent enough. Casa Luna makes sure to only use the real deal when it comes to quality hemp oil. Every single bar you buy is absolutely legal, high-quality, delicious, and potent. You can’t ask for much more than that. Why Order Casa Luna CBD Chocolate Online? 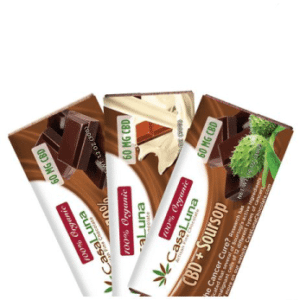 There are plenty of reasons why you might want to buy one of their products, but why should you buy your next Casa Luna CBD chocolate bar online? It’s simple, really: we’ve carefully curated our web shop to make sure it offers only the best quality and selection of CBD edibles available today. And we’ve worked hard to make sure the entire process is as straightforward as possible. Browse and buy from anywhere, at any time, with Healthy Hemp Oil. Remember: If you are lactating, pregnant, or suffering from a serious illness, ask your physician before taking any supplements, applying topical oils or ointments, or changing your diet in any significant way. Also, remember to keep your Casa Luna chocolate bar in a dry and cool place, out of the reach of children and pets. This attention to detail extends to our carefully curated selection of CBD edibles, including the Casa Luna CBD chocolate bar. It’s incredibly important to us that you feel confident in your next CBD purchase, and if you’re ever unsure about anything related to CBD, our friendly and knowledgeable support team are only a click away. Check out the tasty Casa Luna CBD chocolate for sale, or get in touch if you have any questions.